Grahame and Susan Eathorne from New Zealand. A tourist who had a cardiac arrest while enjoying a dream cruise off the coast of Aberdeen has given a heartfelt thanks to the coastguards who saved his life. Graham Eathorne, from Wellington, New Zealand, was on the trip of a lifetime on the MS Brilliance of the Seas. The 77-year-old and his wife Susan had left port in Edinburgh and were en route to St Petersburg when Mr Eathorne began feeling chest pains in the middle of the night. A doctor on the £274 million luxury liner assessed the pensioner and said he would need to be transferred to hospital on dry land. The Aberdeen coastguard team were contacted and, at about 1.10am last Tuesday, a helicopter was despatched to rescue Mr Eathorne. It took him on the journey over the North Sea to waiting medics at Aberdeen Royal Infirmary. He spent five days in hospital recovering from his ordeal before being discharged. After leaving, Mr Eathorne was then given a hotel stay at the Aberdeen Douglas to recover further with his wife joining him. But before leaving to return to his native land tomorrow, the Eathornes were determined to personally thank the coastguards for their efforts to help save his life. Yesterday the pair made the journey to the service’s Aberdeen base at Blaikie’s Quay and delivered some morning tea for the staff. Mr Eathorne said: “It was late at night when I started feeling these stabbing chest pains. “The doctor called the coastguard and they came out – which couldn’t have been easy in the middle of the night. 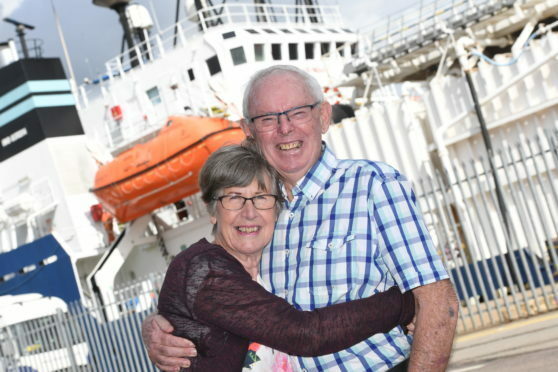 Jamie Sangster, coastguard station office for Aberdeen Coastguard Rescue Team, said: “It was wonderful to see that Graham had made a good recovery after taking ill on his cruise.